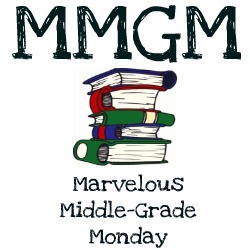 It’s another Marvelous Middle-Grade Monday! Today, I’m featuring MG author Kai Strand and her Weaver Tales. Visit the village of The Tales, where residents are called Word Weavers, and speak in story. Each book in the series is a standalone story with a new set of characters. All except the one little gnome-elf, Unwanted, who manages to stir up trouble whenever he grants a wish. The Weaver a story of persistence. In a town of word weavers, Mary suffers through her third year of Novice Word Weaving. Mary thinks her troubles are over when she meets a gnome-elf who grants her a wish. But instead of weaving a better story, she’s weaving strange yarn charms to accompany her still pathetic tales. GuardianAngel Publishing, Amazon, and Barnes and Noble. Add to Goodreads. The Wishing Well a story of not letting others define you. Guardian Angel Publishing, Amazon, and Barnes & Noble. Add to Goodreads. The Lumpy Duckling a story of friendship and expectations. The teacher lifted her gaze to the ceiling before taking a deep breath. A frequent reaction she saved for the girl who squatted to the floor again and continued scooping up her papers. “Very well, Eloise. Make it quick.” Glancing across the room she smiled fondly at Wendell and checked his name off on the roll sheet. Not one to allow an opportunity to make fun of a less popular classmate pass her by, Tosh hissed a tale at Eloise. by dropping all her prized belongings. “Horror?” Tosh crossed her arms over her chest and spun on her lab stool presenting her back to Wheezy. Smiling to herself, Wheezy stuffed her papers into her folder. Tosh’s usual style of Word Weaving was actually a pretty standard storytelling voice, nothing close to horror, but Wheezy couldn’t resist the dig at the girl’s mean personality. With all her papers collected, Wheezy scrambled onto her own stool at the table next to Tosh just in time for Mrs. Frickles to start the day’s lesson. About the author: Kai Strand writes fiction for kids and teens. Her debut novel, The Weaver, was an EPIC eBook Awards finalist. Her young adult title, King of Bad, soared to the publisher’s #1 spot in its second month and stayed on the Top 5 Bestsellers list for eight months. She is a (very lucky) wife and the mother of four amazing kids. The most common sound in her household is laughter. The second most common is, “Do your dishes!” She and her family hike, geocache, and canoe in beautiful Central Oregon, where they call home. Learn more about Kai and her books by visiting her website: www.kaistrand.com. When best friends Valerie and Samantha discover a magic mirror in Val’s 100-year-old barn in southern Minnesota, they eagerly go throug h it. Immediately they run into the young Snow White, who has just escaped the huntsman. The girls vow to help her find her father, knowing the dangers that await. On their journey, the fun-loving double-trouble duo quickly discovers they are caught up in the middle of their favorite fairy tales. “This is not just a mirror,” Samantha whispered as she put her hand on the glass to touch it. To their surprise, it passed through as if nothing were there. All they could see was the end of her arm and what appeared to be the forest. She pulled her arm back in a hurry, worried that her hand would no longer be there. Sam carefully inspected the back of her hand, flipped it over and studied her palm, then wiggled her fingers. The two of them stared from Samantha’s hand back to the mirror with their mouths as wide open as their eyes. “That so did not just happen!” Samantha put her hand back through again. She stopped when they saw the possum walking away, getting smaller and smaller. “A magic mirror!” Valerie shouted. “No way! I have been waiting my whole life for something exciting to happen to me!” Without another minute of hesitation, Val squeezed her body through the narrow frame, leaving Samantha sitting there with her mouth wide open. Ann T. Bugg is the Queen of her castle in northern Minnesota where she lives with her Knight in shining armor (who has come to her rescue more than once) and her own little Princess Valerie. The pets in her magical kingdom come in all shapes and sizes, as do all the critters that make their way out of the enchanted forest. She enjoys horseback riding and long walks with her dogs, but writing will always be her first love. I’m sharing an excerpt today from The Dragon’s Cave, my first middle grade novel. It’s up for nomination on Kindle Scout (please, please, please go and nominate it?). Seamus opened his eyes, blinking to make out the picture in front of him. Treetops. Filtered sunlight. The air smelled woodsy. “Seamus, what are you doing, boy? Taking a nap?” a man’s voice said, his English—or was it Scottish?—accent unfamiliar. Seamus scrambled to his feet and dusted himself off. And then froze. What was he wearing? Tights? Leather lace-up boots? And where on earth was he? It appeared to be some sort of meadow, not…his mind grew fuzzy trying to remember where he had just come from. All he remembered was the brightest flash of light he’d ever seen. “Come. Supper is ready.” The man wore strange clothing—a cream-colored tunic with the emblem of a crimson dragon embroidered on the front, like a knight from the Medieval Dinner Theatre where his mom once dragged him. Something about the knight seemed familiar, although he had never seen his face before. He glanced down and realized he, too, wore a tunic with a crimson dragon. Was this some crazy dream? He touched his face. Who was he? Did he appear different? Had he somehow fallen into another boy’s body? Some kid in medieval Scotland? A tickle on his neck made him bring his hand back to find shoulder-length hair. He pulled it out to see the color—a darker brown than his sandy-blond mop back home. The knight’s eyebrows drew together. “Come on, boy, what is the matter with you tonight?” He didn’t wait for an answer, just turned and walked away while Seamus trotted to keep up. They entered a clearing where many other knights milled about, some sitting on logs and rocks eating, some standing and talking. A large tent on one side bore the same dragon emblem they wore on their tunics. A fire burned in the middle of the clearing, and a large kettle hung over it, suspended by a chain and a tripod of sticks. The sight of a boy his age made goose bumps prick his skin. Andy. The memory of their parting scene came back in a rush—Lacey falling in the wash, Andy’s joy that he couldn’t race, the bolt of lightning… Had it struck him? Had he died and come here, to this place? It sure didn’t seem like any version of heaven he’d ever imagined. Nor did it appear to be hell or even purgatory. What was this—medieval times? A DRAGON’S TREASURE. A GREEDY KING. ONLY ONE BOY CAN RESTORE BALANCE BEFORE THE MOUNTAIN IMPLODES. Seamus’s day couldn’t get any worse. His best friend stops speaking to him, his cross-country coach benches him, and lightning strikes him down, right in front of his middle school. But it does get worse. When he wakes up from the lightning, he finds himself trapped in the body of a squire in medieval Scotland, preparing to face a dragon. Please help me out by giving The Dragon’s Cave a vote over at Kindle Scout. If The Dragon’s Cave is selected for publication by Kindle Scout, you will receive an early, FREE copy of the book as a thank you for taking the time to vote. You can read the first two chapters for free by joining my newsletter. Also, be sure to enter to win the giveaway of hardcover books of the two JK Rowling scripts, Fantastic Beasts and Where to Find Them screenplay and The Cursed Child. Enter to Win Two JK Rowling Hardcover Books! For my review of how Fantastic Beasts works as bedtime reading see this post. After sitting on the manuscript for my first middle grade novel for over a year, I finally finished edits and sent it off for publication. The prompting came from Katie Rose, my eleven-year-old, who seemed to have an avatar moment. We were driving home and she asked me what I was thinking about. She spoke with such conviction that I decided to follow her advice. I could re-write until I’m ninety and probably never think it’s perfect. It’s time to move it off my plate and move on to fresh projects! Today I worked with copywriting guru Bryan Cohen to rework my blurb, and I pretty much love the way it came out. See what you think. I’m pleased to welcome Donna Cook, an author I met twenty years ago. We both studied writing at Knox College and you can see from her new release, Donna has put her education to good use. Her first book, The Gift of the Phoenix won 1st Place Fantasy in the North American Book Awards and Kindle Book Review Book of the Year Award Semifinalist. The Lost Branch is the newest book in the YA fantasy Lost Branch series. A portion of ash stuck on the altar at the Rock of Light reveals a mysterious new threat. Corren embarks on a perilous quest for the secrets of a long-extinct branch of the Order. In his absence, a menacing illness threatens the extinction of the earth faeries. But is it Nicolai’s healing they need or Corren’s powerful staff? And while Marcellus delves further into his bond with the element of water, he finds it may require more than he’s able to give. In this intriguing continuation of Cook’s epic saga, Gift of the Phoenix, the Three discover the power of ancient secrets, new enemies, and treacherous desires. Together, they must protect their world from its most dangerous threat yet. If it isn’t already too late. 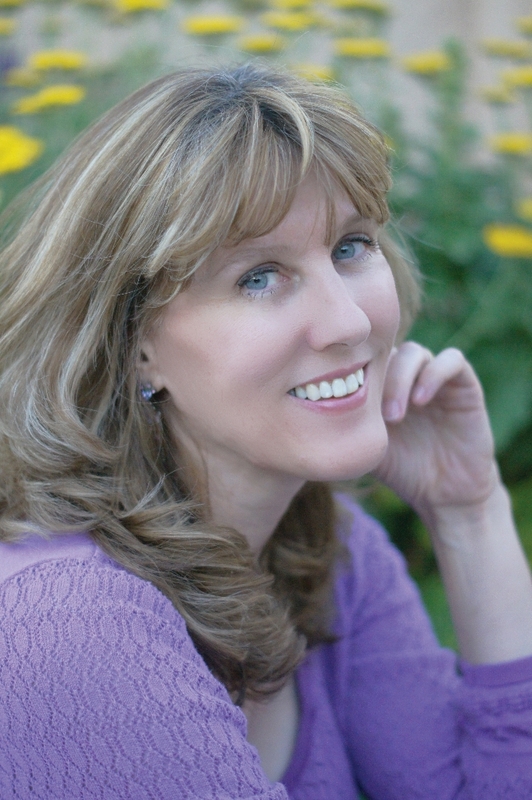 Donna Cook is an award-winning author and freelance book editor. Her epic fantasy adventure, Gift of the Phoenix, has won numerous awards, including 1st Place Fantasy in the North American Book Awards and Kindle Book Review Book of the Year Award Semifinalist. She’s an Arizona native transplanted to Boise, Idaho, where she is delighting in the change of scenery. 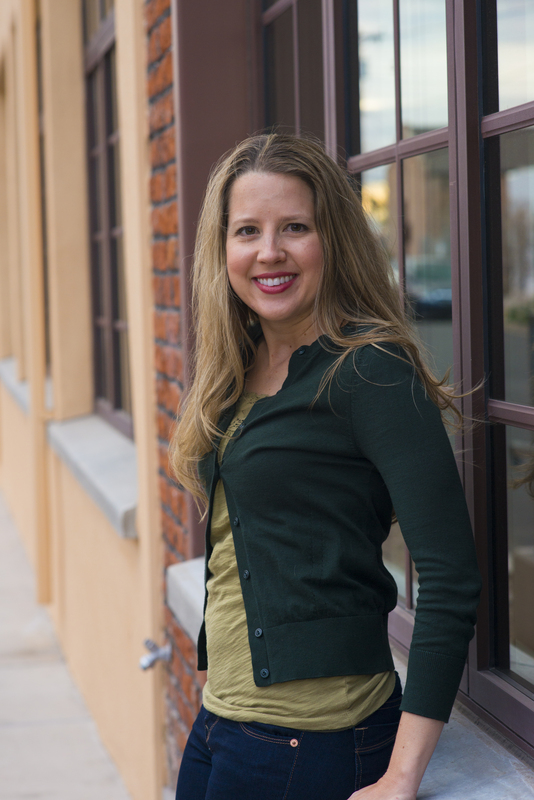 When she’s not writing her next novel, she spends her time chasing the kids, exploring delicious eateries, and dancing with her talented husband (Salsa, baby!). She also makes a mean Navajo taco. Katie Rose: How did you get the idea for this book? Iva: The idea for Black Cats and Ballet Slippers came about during my last year of teaching middle school science. In the book, Gemma’s science teacher, Ms. Pruett, has a really creepy classroom. The classroom has a preproom with lots of “witchy” things, such as powdered unicorn horn and other ingredients for spells. In my classroom, I also had a big preproom. My classroom was actually very nice and not creepy at all, but over time my imagination took over. I started to envision this preproom as being Ms. Pruett’s! Then, to my already existing “witch’s brew” of story ideas, I added my love of dance, which is something that I’ve done since I was a kid. Rose-Marie: Have you ever made a false assumption about someone the way Gemma did? Iva: When I was growing up, my family and I lived in this quiet little neighborhood. One day we got some new neighbors. I was convinced that it was one of the New Kids on the Block moving in with his parents! I thought it looked just like him. I thought that if I played my New Kids on the Block tape really loud on my boombox with my bedroom windows open, he would come over and introduce himself. Needless to say, it ended up NOT being one of the New Kids. Definitely a false assumption! Katie Rose: Why did you choose the title Black Cats and Ballet Slippers? Iva: The title Black Cats and Ballet Slippers just popped into my head one day! Even though Gemma tells the story through her diary, there are a lot of books out there that already have “Diary” in the title, and I wanted to do something different. Then one day… TA DA! I just knew it was the perfect fit. Rose-Marie: What made you choose the journal style of story-telling? What did it make easier in telling your story, and what challenges did it pose? Iva: I really wanted the story to be funny and light-hearted, even though there is some Halloween spookiness going on. I thought, what better way than in diary format? I found it very easy for Gemma to tell her story, straight out of her own head and onto paper. One of the challenges I came across with this style was near the end of the book. So much happens in such a short period of time, and sometimes it was challenging to give Gemma enough opportunities to write everything down! Katie Rose: Why did you want to become a writer? How many books did you write before you wrote this one? Rose-Marie: Are you working on another book now? Iva: Yes! I’m actually working on a sequel to Black Cats and Ballet Slippers. All of the same characters will be there, along with some new ones. I’m really excited to introduce them to everyone! Katie Rose: How long have you been writing books? 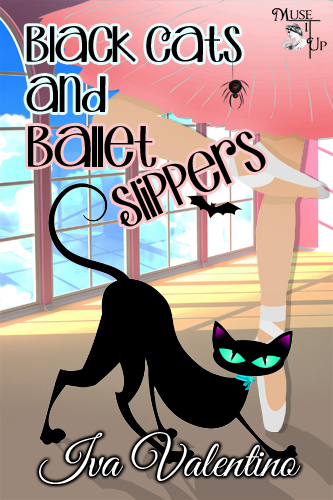 Iva: Black Cats and Ballet Slippers is my first published book! It came out a year ago, last March. Rose-Marie: You used to teach middle grade students– how much of what appears in this book comes from your students? Iva: Teaching kids at the middle school level is what really gave me a lot of insight into writing about kids at this age. I absolutely LOVED working with middle schoolers! They told the best jokes and made me laugh every day. However, there aren’t any students or teachers that I’ve based any of the characters off of—they are all completely original characters! Rose-Marie: I loved the interaction between Gemma and Joey – I think you nailed the middle grade boy/girl experience there. Did you go to a dance with a boy when you were in middle school? Any awkward boy stories to share? Iva: Haha! I love this question. I went to several dances in middle school. And—yes— they were VERY awkward. Middle school was just a very awkward time for a lot of kids! Although I wasn’t tall like Gemma, I was super skinny and always felt self-conscious. I was very shy and I think I only danced with maybe one or two boys. I definitely would have liked to have a boyfriend, but I never had one until I got to high school. I had a diary during my middle school years, and I always filled them up with stories about all of my secret crushes! Iva Valentino lives in Arizona with her husband and their dog, Lupo. She graduated from the University of Arizona with a Bachelor’s degree in Biology and a Master’s degree in Education. She loves living year-round in the warm desert. Iva spent many years as a middle school teacher, where she enjoyed teaching her students all about science. She currently works as a science editor at an educational publishing company. She loves travel, yoga, and photography. There is nothing that brings her more happiness than a good dance class! Rose-Marie Lyttle: What was your favorite childhood book? Ruth Silver: The Velveteen Rabbit, it’s not only a beautiful story but also quite sad. Plus I love rabbits, I used to have one in college (that I snuck into my dorm room). Rose-Marie Lyttle: What do you like to do besides writing? Ruth Silver: I love to read, which probably goes without saying. I also enjoy photography, video games, karaoke, traveling and just hanging out with my friends. Rose-Marie Lyttle: Do you have any plans to write a spin-off for Aberrant? Ruth Silver: Yes! I am currently working on an untitled project that is a prequel, spin-off. I haven’t spoken much about it, but I will say there is plenty of action and a world to explore that we’ve barely touched in the Aberrant trilogy. Rose-Marie Lyttle: How did you come up with creating Cabal, dystopian society in Aberrant? What inspired you? Ruth Silver: The name itself, Cabal, comes from its definition. “A small group of secret plotters,” which I felt fitting for a dystopian society. I wanted the name to signify a revolution, because Cabal is not the perfect society that the government wishes and pretends it to be. I wanted Cabal to strive for Utopian but instead of being perfect, it was something else entirely. The inspiration itself comes from most of us striving towards perfection. I don’t think there are many people that want a world without jobs, filled with homeless people that are starving. I think it’s easy to see what’s going on in society, what’s happening now and see a glimpse of the current world in its worst. It made me want to imagine a better world and then I realized how would this perfect world be flawed? Rose-Marie Lyttle: In few words, why should we read your book? Ruth Silver: I believe Aberrant will appeal to readers who liked the suspense of The Hunger Games, the thrill-seeking tests of Divergent and the romance and unique abilities of Graceling. Rose-Marie Lyttle: What was the hardest part of writing Aberrant? Ruth Silver: The hardest part was writing the characters suffering. I know that they will get through the pain – physical or emotional – and it will make them stronger, but it’s still hard to torture your favorite character. Rose-Marie Lyttle: Who was your favorite character to write in Aberrant? Ruth Silver: I had the most fun with writing Olivia. She’s full of so many mixed emotions and traits that we’re always learning something about who she is. She’s not complacent. She has a mind of her own and likes to explore the world around her. She’s curious by nature and it has the tendency to get her into trouble. She’s complex, which makes her three-dimensional, but also incredibly caring and supportive of those she loves. Rose-Marie Lyttle: Why did you decide on making Aberrant into a series? Ruth Silver: I felt like I had a huge story to tell. Something that would span across hundreds of thousands of words. That may not seem like a lot but when sending your novel to agents and publishers, there’s a certain word count they’re looking for in new authors and in young adult/new adult titles. The only way to properly tell the story, was to turn it into a trilogy. Rose-Marie Lyttle: How long have you been writing? Ruth Silver: I started writing poetry and just putting my thoughts onto paper when I was in high school. I loved reading fan fiction and it wasn’t long before I started writing it. In college, I spent at least as many hours writing as I did studying and going to class. I had some friends that were supportive and there were others that thought I couldn’t do it, which made me even more determined. Rose-Marie Lyttle: Where did the idea for Aberrant come from? Ruth Silver: The idea of Aberrant came from both my imagination and personal experience. The story developed out of choices that we have and that each of us make. I wanted to delve into those choices and imagine a world where they weren’t given to us but expected of us. Rose-Marie Lyttle: How are you like, or unlike, Aberrant’s protagonist, Olivia? Ruth Silver: At eighteen, Olivia is incredibly brave. She’s thrown into this tough situation and forced to leave her family and the only home she’s ever known. I couldn’t imagine leaving those I love behind. I wouldn’t want to. So much so, that I’d probably refuse to go. Rose-Marie Lyttle: What are you currently working on? Ruth Silver: I’ve got several writing projects underway. Forget Me Knot (Royal Reaper 2) is in edits right now with an expected Spring 2015 release. I’ve got an untitled spin-off for Aberrant in the works, which is a prequel story. Elfinland (Orenda 2) is about half-way written. To top it off, I’m also writing steamy adult fiction under the name Ravyn Rayne, which will be available this year as well. You can find those projects on Ravyn Rayne Reads. Ruth Silver is the best-selling author of the Aberrant trilogy. With a passion for writing and a love of story-telling, Ruth is actively writing YA fiction under her own name and adult romance novels under Ravyn Rayne. Her interests also include traveling, reading, and photography. Her favorite vacation destination is Australia. Ruth currently resides in Plainfield, Illinois. She can be found on Twitter, Facebook, and her blogs Write Away Bliss and Ravyn Rayne Reads. My nine-year-old, Katie Rose, and I recently read The Time of the Fireflies by award-winning author Kimberley Griffiths Little. It’s a lush, rich story set in the Louisiana bayou about a girl who shifts through time with the help of a swarm fireflies to uncover the mystery behind a family curse. We liked the book so well we connected with the author to ask her a few questions about it. Katie Rose: What genre is The Time of the Fireflies? Mystery? Literary Fiction? Fantasy? Kimberley Griffiths Little: Actually, this book is sort of a mash-up of time-slipping, mystery, family drama, and magical realism. I tend to stay away from calling it a true fantasy because the story is set in the contemporary real world with real people (not witches or ghosts or “creatures”) and a few real-life problems the characters are dealing with. When we think of fantasy we usually think of an entirely new world the author has created with a set of magic rules. Rose-Marie Lyttle: The setting is such an integral part of the book. 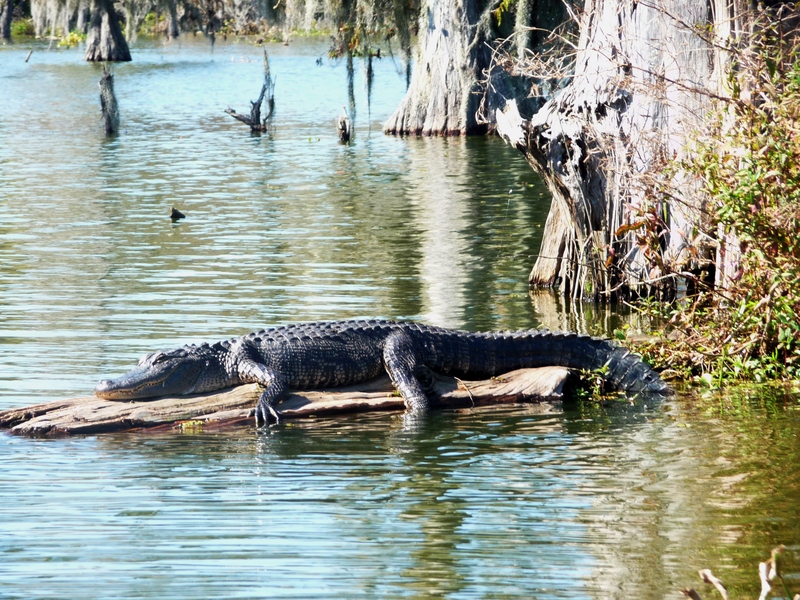 Do you draw your knowledge of Bayou Teche from personal experience? Katie Rose: Is the Island of Dolls a real place? VERY CREEPY place, much creepier than The Time of the Fireflies. People who visit the Island say the dolls are possessed and sometimes blink their eyes and whisper to each other at night. Eeek! Rose-Marie Lyttle: I was a little nervous when Katie Rose and I started reading that the book might be too scary for her. There is something inherently terrifying about possessed dolls. Did you have to tone it down to make it readable for middle-grade? Kimberley Griffiths Little: I worried that it might be too terrifying, but I had my audience in mind as I wrote it (speaking as a childhood doll lover) and knew where to draw the line. My editor didn’t have me tone anything down, but I worked on those scenes with the doll *coming alive* many times to get the tone right. I also wanted the story to include redemption and love so as not to leave those scenes with only negative connotations. Love and forgiveness and redemption are much more powerful than greed and selfishness. Katie Rose: Do you have other books that I might like? Kimberley Griffiths Little: Of course! 🙂 I’ve written three other MG novels set in Bayou Bridge with other characters from the town. 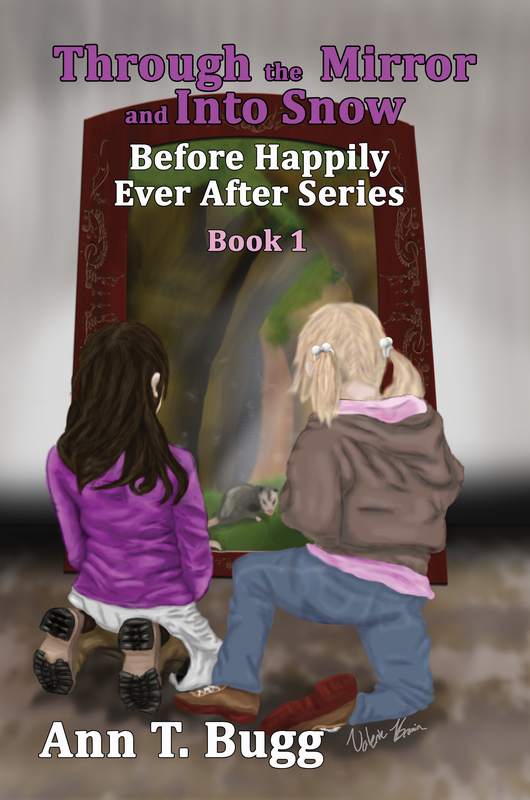 All 4 books have fun little connections between the characters and past events so readers love meeting the four different girls and going more deeply into their stories and mysteries and families. Rose-Marie Lyttle: I loved the part with the Cajun traiteur. Have you ever seen a traiteur yourself? Kimberley Griffiths Little: Yes, I’ve met several traiteurs, actually. On one of my research trips I did a 2-week road trip with a very good friend of mine who grew up in the South and we met lots of wonderful people who knew traiteurs and helped set up times for us to meet them personally in their homes. Everyone we met was very friendly and generous. I loved it. Rose-Marie Lyttle: The Time of the Fireflies incorporates elements of magic (time slipping, possessed doll, etc). I assume you were drawing on Louisiana Voodoo, but I also know you live in New Mexico and I thought I recognized the flavor of the “magic realism” of Spanish-American fiction. Where did the inspiration for incorporating magic into this book come from? Kimberley Griffiths Little: In New Mexico there are herbal folk healers called curanderos who are very similar to Cajun traiteurs, and their history goes back several hundred years as well. Traiteurs and Curanderos use a mix of herbal medicine and faith, with a bit of folklore and mysticism, or “old wives’ tales” mixed in. When I first learned about traituers, I knew I wanted to incorporate them into my first book, The Healing Spell. It took a lot of digging into special collections and the university libraries in Louisiana to find much. If you want to know more about Miz Mirage Allemand, you must read The Healing Spell and Circle of Secrets. The traiteurs I met are warm and wonderful people who very much believe their gifts come from God and they are to use those gifts to bless others. They do not accept any payment or gift in exchange for their help. Katie Rose: Do you believe magic/magical experiences like this can really happen? Kimberley Griffiths Little: Hmm, personally I’m sort of on the fence. I’m a religious person and have faith in God so I do believe in miracles, and have seen them in my own and other’s lives. Unfortunately, there are people out in the world (we even talked to some in Louisiana, actually!) who have become involved in magic-craft or witchcraft. I tend to stay away from that because I worry that those beliefs and practices are used for mischief or to hurt, instead of to do good and help others. Rose-Marie Lyttle: You don’t touch much on ethnicity, although I believe the issue of race had a subtle presence in the book. Was that purposeful? Kimberley Griffiths Little: When I began drafting this story I knew that the servant girl from the turn of the century would be an African–American girl who had come from slave heritage, but I was too focused on the character’s relationships and purpose to the plot. The Time of the Fireflies isn’t a story about slavery or bigotry. It wasn’t something I purposely stayed away from—it just didn’t fit the story. I hope it was woven into the story in such a way that readers can take away what they’d like from it. From all that I’ve read, researched, and personally experienced, the portrayal in my book is very true to life—back in 1912 and in modern day. When Larissa Renaud starts receiving eerie phone calls on a disconnected old phone in her family’s antique shop, she knows she’s in for a strange summer. A series of clues leads her to the muddy river banks, where clouds of fireflies dance among the cypress knees and cattails each evening at twilight. 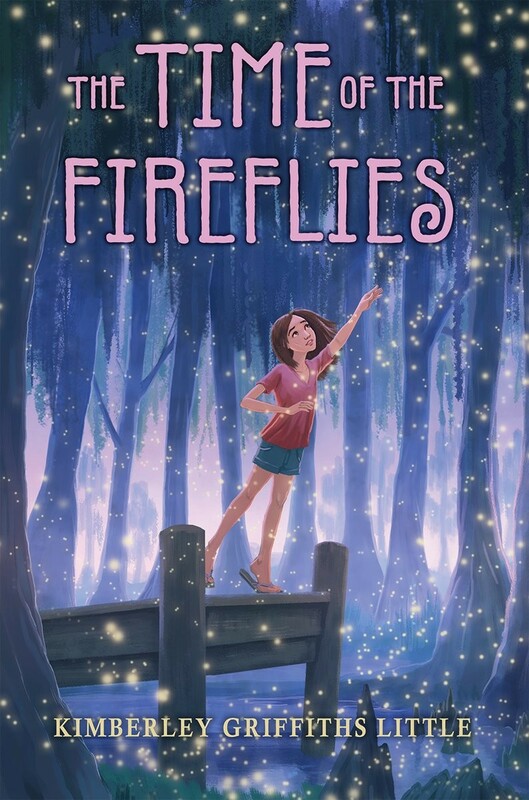 The fireflies are beautiful and mysterious, and they take her on a magical journey through time, where Larissa learns secrets about her family’s tragic past — deadly, curse-ridden secrets that could harm the future of her family as she knows it. It soon becomes clear that it is up to Larissa to prevent history from repeating itself and a fatal tragedy from striking the people she loves. With her signature lyricism, Kimberley Griffiths Little weaves a thrilling tale filled with family secrets, haunting mystery, and dangerous adventure. When I was a kid I read a book a day, scribbled stories, and dreamed about having my very own book on the library shelf. I grew up in San Francisco, but now live in an adobe house on the banks of the Rio Grande with my husband and sons. I think I’ve drunk so much Land of Enchantment water that some of that ancient magic got into my blood and now spurts out my pencil–I mean ergonomic keyboard. Which means I adore anything old and musty with a secret story to tell. I make way too many cookies when I’m writing or revising a new book – and I’ve got the best book trailers in the universe – for reals! Check them out here: www.kimberleygriffithslittle.com. Please find me on Facebook, Twitter, Goodreads, and Youtube. The Dragon’s Cave has been Selected for Publication!